Borrower : Heart Havens Inc.
Heart Havens has seven group homes throughout Virginia that support adults with a developmental disability. The nonprofit empowers its residents to live happy and vibrant lives and empowers them continue to enjoy their passions while pursuing their goals. The idea for Heart Havens began with a simple question in 1993, when a parent of an adult with a developmental disability asked her United Methodist pastor: “Where will my child live when I’m gone?” Over the course of several years, the nonprofit was formed with a mission to not just provide adequate housing, but also allow its residents to continue to live out their dreams. Heart Havens operates under the Christian principles it was founded upon. Not only does Heart Havens provide residents support to continue making friendships, it also gives them access to community engagement and service opportunities. Heart Havens relies heavily on Medicaid reimbursements from its residents, in addition to grants and donations. However, Medicaid reimbursements sometimes lag, placing Heart Havens in a cash bind and making short-term loans necessary. The organization reached out to VCC because it wanted to diversify its banking relationships, and it valued the mission-focused principles of VCC. While Heart Havens – which opened its first group home in Virginia Beach in 1999 – has only about 30 residents at any given time, it has more than 70 employees plus volunteers. That’s because this organization is far more than just a care-giving facility: It has a dedicated staff fully committed to helping its residents live full, meaningful lives loaded with joys and opportunities for community service. 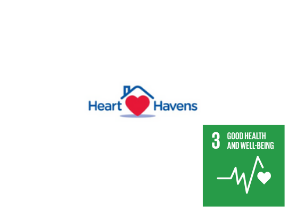 As a mission-focused lender, VCC is committed to supporting small businesses and Virginia-based nonprofits like Heart Havens, that positively impact their communities and the world at large. Heart Havens’ mission is one of service — both serving adults with developmental disabilities, but also giving those residents the support to live deeply fulfilling lives to which they help others. The organization has hefty expenses, and its sources of financial support can be patchy, but its mission is important. Because we’re able to be innovative and give personalized attention to our clients’ needs, Heart Havens was perfectly suited for a VCC loan. If you know someone who could benefit from Heart Havens’ services, or if you’d like to contribute to their cause, visit www.hearthavens.org.